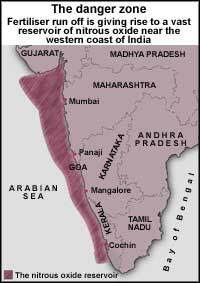 an unknown reservoir of nitrous oxide, a potent greenhouse gas, has been found within the coastal waters of the Arabian Sea bordering India's west coast. This was discovered by scientists at the National Institute of Oceanography, Goa. The discovery of the nitrous oxide reserve, commonly known as laughing gas, could have major implications on the theory of global warming if the phenomena becomes more widespread. The study, led by S W A Naqvi, reports that over the past three years there has been a dramatic decrease in the content of dissolved oxygen in the coastal waters of India. Simultaneously, the content of nitrous oxide and hydrogen sulfide has increased, the highest so far observed in the open coastal waters. Experiments conducted during the study indicate that during the post-monsoon phase, 180,000 square kilometres of the Arabian Sea becomes low in oxygen. This, the scientists opine, is a result of a steep rise in the fertiliser run off rate during the rainy season, which leads to extensive depletion of oxygen content in the coastal water. Nitrous oxide is mainly produced during two processes: nitrification and denitrification. In nitrification, ammonium is transformed into nitrate and in dentrification, nitrate is transformed into dinitrogen. The amount of nitrous oxide produced by either of the two processes depends on the prevailing oxygen condition. Maximum nitrogen is generated only when the oxygen content of the water is low. This means that significant nitrous oxide accumulations in the ocean will probably be found under oxygen-depleted conditions. Nitrous oxide is a potent greenhouse gas and scientific estimates show that it is 200-300 times more potent than carbon dioxide. In the lower atmosphere (troposphere), the content of nitrous oxide is only 0.00003 per cent of the total gases present. But its effect on climate and atmosphere is much more as compared to other gases. A molecule of nitrous oxide is about 200-300 times more powerful in warming potential than a molecule of carbon dioxide. Another drawback of the gas is that it is not removed from the troposphere by natural chemical reactions and, therefore, can reach the middle atmosphere (stratosphere). Here it is photochemically destroyed, forming nitric oxide that destroy ozone. Therefore, nitrous oxide not only causes global warming but also leads to the depletion of the ozone layer. In the past century, the atmospheric concentrations of nitrous oxide have been increasing steadily. Besides the soil and oceans there are other sources of nitrous oxide such as biomass burning and emissions from industrial processes, automobiles and the most potential of all, nitrogen containing fertilisers that increase nitrous oxide released from soils. In fact, according to the scientists, fertiliser run off into the Arabian Sea is primarily responsible for stimulating the production of nitrous oxide. During international conferences organised on global warming, India has always argued that since its per capita carbon dioxide emission is negligible in comparison to countries like the us, there is no need for India to reduce its carbon emissions . But with this discovery, India's argument may no longer hold true as a mere 0.5 per cent of the world's ocean off India may be contributing a disproportionate amount of up to about 21 per cent of the global output of potent gas. The nitrous oxide emissions from the area of ocean that they investigated over a period of only six months range from 0.06 10 12 gramme (g) to 0.39 10 12 g. Comparing those figures with estimates of the global annual output of nitrous oxide from the oceans, reveals a contribution of 0.4-21 per cent from an area that is only about 0.05 per cent of that of the world's oceans. This new report, once confirmed could very well tilt the balance against India. RAMashelkar, the director of the Council of Scientific and Industrial Research, New Delhi, was quoted by a newspaper saying that the team would be given a special grant of Rs five lakh to undertake more research. According to Naqvi, only further studies can confirm whether this increase in nitrous oxide is due to natural reasons or is it due to human activities. But whatever may be the outcome of future studies, the discovery at present could mar India's negotiating position in future international climate change conferences.